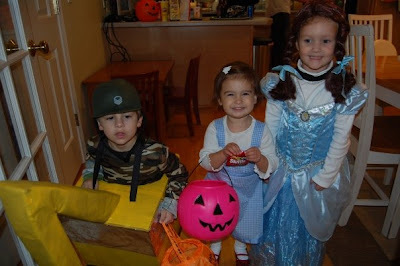 The Incoherent Ramblings of a Stay at Home Mom: Halloween, Halloween, Trick or Treat! Am I the only one with that blasted Dora the Explorer song stuck in her head? We had a great Halloween, as usual. 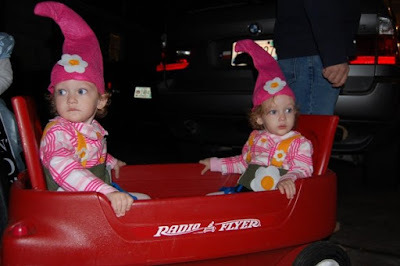 We managed to get out for a little "sans kids" time and hit a Costume party on Friday night which led to a more subdued and chilled out trick or treating night with all of the kids. We were just a teeny bit hungover and tried as we might, none of our bodies were accepting the alcohol we were trying to consume on night two.. Arrrgh!!! Now I have that Dora song stuck in my head. I was good until you reminded me about it. 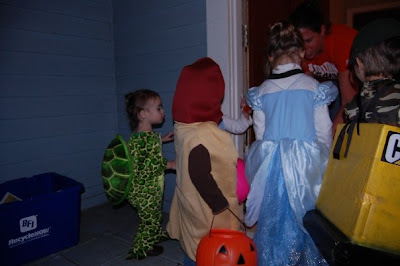 We didn't have the non-kids time, so no hangovers, but we did dodge raindrops which affected our trick or treat fun. See my blog at http://wifeofhousehubby.blogspot.com for my ramblings. They're too adorable!! I love it! AWWW! These are GREAT photos! Really cute! I LOVE Halloween! VERY cute! The CAT costume fascinates me! Did somebody home-make that? Super cool!! !